Gordian is a quite simple device in its appearance, featuring a chassis of standard size and a clear and easy to understand user interface. What immediately draws the attention is the OLED-based screen, centered on the front panel, where all the necessary information and menu options are displayed. The user interacts with the device through a jog dial on the left side, while to the right is a switch that controls the display mode, i.e whether it will remain permanently on or off, or if it is activated only while the device is turned on. The Gordian follows Lab12's affinity to simple and easy to use designs. 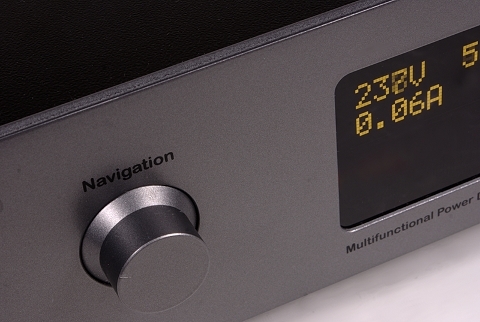 The large OLED screen provides a wide variety of power quality measurements and, also displays the menu user should use to access various settings. Through the menu, the user has access to a wide range of information and functions. 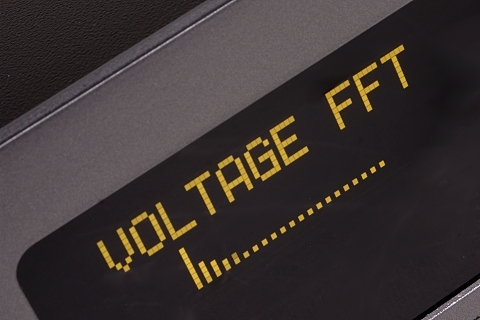 On the information part, there is the possibility to check some fundamental values of the mains such as the voltage, the current, the frequency and the electric power and, also, to perform a distortion analysis of voltage and current waveforms (displayed either as a static, numerical percentage value or as harmonics, in the frequency domain, through an FFT), measure the DC component and the power factor, and, finally, measure the high-frequency noise (EMI). On the functions part, Gordian offers automatic or manual power factor correction (the system tries to approach the value of "1", which ensures optimal absorption of energy from the grid), auto or manual selection of the EMI filter efficiency (in two levels, depending on the local power mains quality), and the automatic or manual selection of the filter used (between differential and common mode, DMF/CMF), depending on how the noise is allegedly infused to the power line. Menu navigation is quite simple and is done by this jog dial. 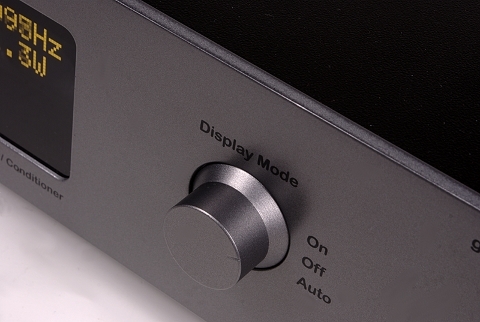 The user controls how the display functions through this selector. 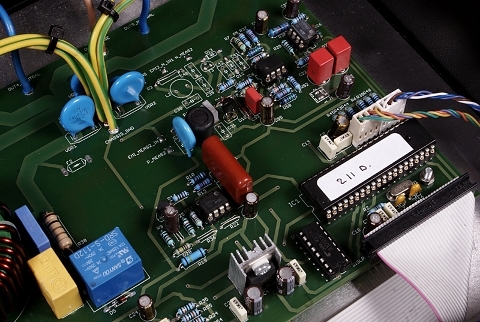 Other important features offered, are the tests the user can perform to ensure Gordian's correct polarity connection to the power grid and that the grounding path is both functional and of enough low-resistance (as required by the standards). This, last one, is crucial by the way: If the ground test fails, the problem could be much serious than of an audio quality degrading factor and the user needs to contact a certified electrician, as soon as possible, for safety reasons. Other menu-accessible settings include those of the display brightness and a power threshold, below which the Gordian considers that the system is turned off and deactivates automatically. On the back side of the device, there are six heavy duty sockets (of Schuko type for the European version we had for this review) divided into two groups. The high-powered group comprised of two sockets with a maximum current of 15A and a filter network with a somewhat less suppression capacity, while the low-powered group comprised of four sockets with a maximum current of 4A and a more effective filter. 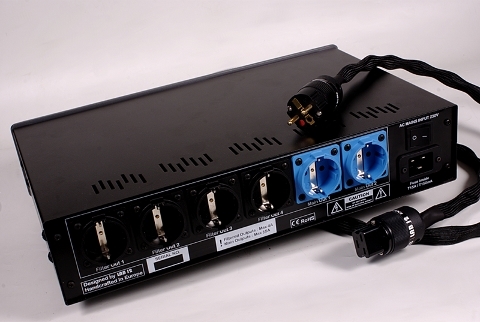 The device connects to the mains through an IEC C20 (20A) connector, where a Lab12 "knack" power cable is attached. The knack cable, included with every Gordian, is a heavy-duty power cable with three 6mm2 conductors, shielded both in the neutral and phase and terminated with custom gold plated connectors. In total, the device can handle up to 20A. 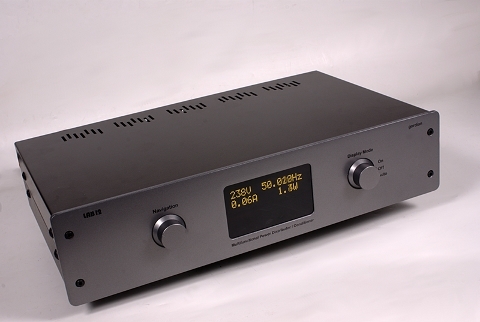 Six outputs, capable of 20A in total, split into two high-power (15A maximum current) and four low-power (4A maximum current) are available. The cable supplied with the device is a shielded Lab12 knack. 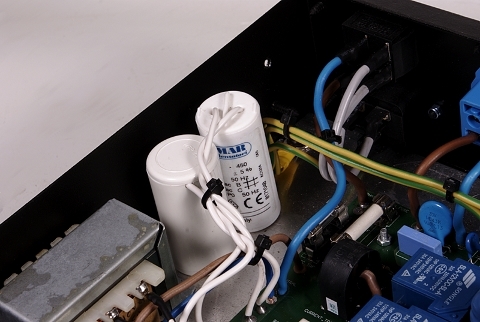 These are the capacitors the Gordian uses to correct the power factor. Inside its chassis, Gordian hides a quite interesting and complex construction in the center of which are its power line filters. The filter topology is determined by relays, controlled by the user menu options, in real time. 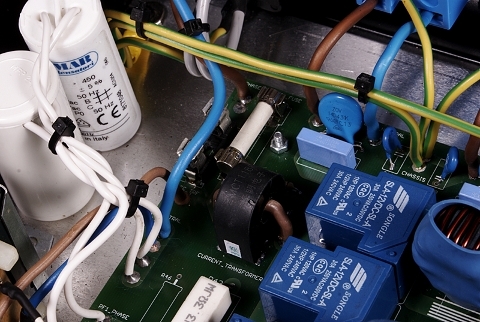 Near the power input, one can identify the power factor correction capacitor bank and the current measurement sensor, which -basically- is what is known as a current clamp. The biggest part of the circuit real estate is occupied by the power quality analyzer. This, probably, is the most interesting part of the device and it is the part of the circuit that offers the quite broad selection of Gordian's functions. The analyzer uses 256 samples per power cycle and includes eight measurement channels with the associated a/d converters needed to input the data to its processor. Besides displaying all the relevant measurements and analyzing the mains voltage and current distortion in the frequency domain (up to the 128th harmonic), the software, which is developed by Lab12 themselves, takes a series of decisions concerning the power factor correction, the filter topology (DMF or CMF) and the level of suppression (Low/High) the filter offers, if the user has selected the automatic mode for each of these parameters. During everyday use, it is quite possible to "hear" the Gordian changing configuration, switching to a different filter mode, depending on conditions detected. Gordian, finally, includes some configuration options (calibration) which, however, could only be activated by a certified service person or an authorized dealer. This ferrite ring, through which a large diameter conductor passes, is used for the current measurement. This is the filter network. The configuration is done via the relays and when Gordian is in auto mode, the user will hear them changing states to adjust the device accordingly. 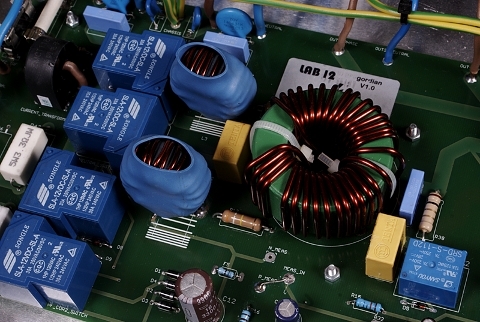 The power quality measurement/analysis circuit and its control software are both developed by Lab12. In addition to the measurements, this part of the device also takes decisions on automatic filter setting by assessing the mains network noise in real time.